In my first ever collaboration blog I share the stage with Dela Dorkenoo. Interestingly we have not met but it is clear that our thoughts are aligned. This piece focuses on the experience of Meditation from two perspectives, one self identifying male, one self identifying female, one in first person and the other as a narrative. However we wrote, we received each others work with fondness in each other’s ability to capture the duality of meditation, actually we have captured the universality of meditation since so much came out of both of our experiences. Not only are Dela and I sharing the stage but we’re also exposing our meditative process revealing something deeper than what you’ve seen in our regular work. We hope you enjoy! I just finished my own version of a 15 minute yoga routine… I’m ready to meditate, I sit down with my legs crossed as the incense continues to burn. Respectfully I ask the universe to understand I will take breaks throughout my meditation to write down what I am feeling; I continue. I close my eyes and take a few deep breaths, in through my nose and out through my mouth but on the third breath I realize they were quite shallow so I intentionally breathe into my lower stomach and out through my mouth. The thought comes maybe I can do a Yoga collaboration with Elle Lyon since I know her and we can sit down and plan and figure out how to make it a worthy collaboration. Ugh I’m straying again, refocus Mel. I breathe in again, into my lower stomach and I let out a low tone of hm. A thought crosses my mind of the first text from this morning and my response, maybe I should have said hello before responding, I hope she doesn’t think I was being rude, and then the address 4 beechgrove crosses my mind as I remember sending it out randomly to one person on Tinder. I close my eyes, in the front of me I see the wavering of the yellow and orangey presence, I don’t really know what to call it but it’s the sure sign that I’m settling in. I laugh and open my eyes “your funny” and I go back into the meditation. I continue breathing in through my mouth into my lower stomach, this time the wavering is light and uncoloured. I straighten my back a bit but it hurts since I’m used to slouching. I ask gently in my head for my guides and Angels to be with me, then I change my words to please join me and I sense one on each side putting their hand on my shoulder and ahead of me I see a diamond of white, it moves slightly to form a tree, but more of a geometric tree. I ask where do I want to go today, the answer is “up”. Up where? “The spaceship” I can see the white, faint red and yellow beam coming from above. But I want to stay present. “Okay” and the sun’s covered by the cloud so it actually gets a little darker but not bad dark. I open my eyes to check and its exactly what I thought. I close my eyes and now I’m able to be nothing to see and think nothing, there is ledge of colours in the shape of the edge of a square and I see nothing in the box but space, open space. I see then a swirl of white light and feel it spiral through my centre a small spiral around my heart reaching down to my root, and I say thank you. Then a larger wider white spiral of light spirals around my head and I see one angel rest her head on my shoulders in comfort and in support. I see my myself floating in a beam of light from above kind of just enjoying the feeling of floating, and my body feels its lightness as bits of me start joining the floating me. I affirm I am in safety. As the white light still surrounds my head and I’m seeing myself float, in the left corner of what I can see ahead, there is an opening of a portal through which a yellow sunlight is breaking through. This light coming through almost like a light through a prism shows itself and I’m a little worried what this is, I have not encountered it before, but I also just affirmed I’m in safety and my guides and angels are with me. As this light gets closer this yellow comes and hits me gently and transforms into beautiful hues of purple, yellow, bright vibrant purple, oranges, greens and indigo, all colours of the rainbow in a dim light but blossoming like a lotus flower and gently brushing my hair to the side as mothers would do to their child in comfort. The blossoming continues across my body across my mind, big waves of colour across me; they continue to go across me. And there goes this big one encompassing all the colours but so thin its similar to the line of the sun showing on an eclipse and it makes a full 360 as if to close the filling of me with the radiance I need to move forward. I paused to write that and I got the message to go back and close. I closed my eyes one more time, and I say thank you guides, thank you angels and as I say thank you Mother earth, she smiles and it gets bright around me, I think the cloud moved out the way of her outside. I look ahead and my angels are in front the first is a girl who has a small face, and says from my heart to yours touching my heart in the way you would donate something to another, and the next angel follows, then my first guide does the same and touches my heart, and then Malcolm crosses my mind he smiles from my heart to yours. And I look up to see my Ancestars smiling and my people from away smiling. I say thank you God, and he nods in affirmation, and one of the angels flies back up. I start to tear up and I open my eyes. Thank you. Background on Malcolm: I’ve only met Malcolm once in my life it was a random day where I worked late and I went to Sobeys to pick up some meat for my ex’s mom to cook for an event. I was stopped while in the frozen section by an older white man with white hair and a white beard wearing a vest with a crest suggesting he just put this on to go out to the store. Malcolm stopped in front my cart and said, I want you to know that you are very beautiful. I’m not use to that so automatically I was like “thank you”but in confusion, and he said you truly are beautiful and I want you to know that you are amazing and you are okay. He continued speaking to me for some time explaining that occasionally he will bump into someone and he just has a message for them and its happens more frequently now but today he saw me and he knew he had something to tell me. I was all ears but also in tears the further he went into speaking. He spoke about whether I was planning to get married and told me If I ask the person if they are willing to be servant to me completely and they hesitate, than that is not a person I want to marry and if I hesitate then the same goes for me. I cried even more because that was the ongoing battle in my head since the break-up. Malcolm continued to speak and at a point he now says, this is a message from your guides they are telling me to tell you this now and he says you do not need to worry, you do not need anyone if you want to be married that is okay but you also will be okay on your own, you are good enough. I balled right there in the middle of Sobeys and then I said thank you. We hugged and he left, I didn’t see him for the rest of my time in Sobeys, even though I was there for another 20 minutes. When I shut my eyes and meditate, my mind takes my higher self into any space or place that my physical body wouldn’t be able to go or handle. Before my meditation, my body is a space station, getting ready to blast my mind, higher self vessel into a spiritual realm. The time is for my higher self to expand and practise expression but I’m still simultaneously conscious of my physical body. One can’t exist with the other, so complete separation can only mean one thing which is death. When I close my eyes, I instantly take off from 0-100 and I turn off my sense of time. I think about where I need to be and just teleport. Now when I take off I have unlimited destinations I can choose, if I can imagine it I’ll be there. I could be deep underwater at the earths crust. I imagine the weight of the water that would crush any physical being that deep. I imagine my breathing like a fish and how the water temperature would feel at that depth. I could be in the sky, suspended in mid air with either a thunderstorm, snow storm or clear sunny sky. Whatever the condition, I make it as real as possible. I visualize the rain beating on my body, the snow smacking on me building up or the heat of the rays from the sun. The sun is another place I visit. I manifest myself inside the sun as if I was part of the core. Everything around me is bright and hot and I feel the vibration waves of the suns rays that are traveling outwards. I envision the natural elements as much as possible whatever the condition. I also try to stay in first person as well, how I see the world in the physical realm is how I try to navigate the spiritual, meditative realm. My biggest hurdle was staying focused with no distractions when I first started meditating years ago. I still swerve of course from time to time but I can meditate for extended periods without distractions carrying off and thinking about these natural conditions helps. Staying in first person has been very challenging. I don’t like looking at my higher self from a third person view, I AM my higher self so I feel like my entire meditation as my higher self must be done in first person. Sometimes I go back and forth from being my higher self and looking at my higher self. Sometimes I have several “multi-screens” One as first person, another watching my higher being and another watching my grounded physical in whatever location I’m in. One way I try to reinforce first person and get rid of the screens is looking down or towards my physical self meditating if I am in a position where I can look and zoom down. This also reinforces the physical being connected with the spiritual. On more thing is sound, if there is some type of noise in my surroundings I drown it down with my thoughts. I always try to keep it as quite as possible but sometimes you hear cars, animals or even commotion outside. If I meditate outside I do the same thing, I don’t shut it off and let it fade into background noise. I find that if you try to shut the noise off, which is impossible, you end up distracting yourself, so I let it be. If its silence, I tune into the frequency of the silence. The main point is that my thoughts and imagery stay the loudest. My favourite place to take my higher self into is the universe. Suspended among the stars, sun, moon and dark matter. From this position, I can really look down at myself on earth. We speak things out into the universe which picks up the vibrations. What better place to meditate in other than that same universe and bring meditative vibrations straight to the source…. Now whatever location my higher self settles in, I usually reflect on my life and being. Problems, challenges but also the solutions, successes and positives as well. I’m not beating myself up in my higher state I’m just checking myself. If my vibrations feel low, I clear my chakras to raise them back to normal. If my vibrations feel high or it’s a second meditation of the day (I don’t often do), I go through a concentration technique and keep distractions out for as long as possible. I focus on something, the ocean pulling back and forth, the rays of the sun traveling. I focus on this one image until I feel spiritually full and ready to move on. The main goal is to keep distractions out and re-center myself if they seep in. Another concentration technique is I charge my higher self, which is usually my last part of mediation. I envision this charge as an electric magnetic charge that comes from my nerves. It travels and safely electrocutes every part of matter of my higher and physical self. It energizes my existence and rids my mind body and spirit of negative thoughts and emotions. I visualize my aura expanding as far and wide I can imagine it. These charges help transform my higher self into pure energy, pure light, pure dark matter, pure gas, pure darkness, pure electricity or a combination of everything. I do this for any amount of time before I get distracted. If I do and don’t feel charged, I re -center myself and restart the charge. Whenever I get off course I centre myself and continue. I either use this charge to continue reflection on my being, or come back to the physical 100-0 when I open my eyes. It’s not about separating the physical from the spiritual, that’s the definition of death. This is time for my spirit to live free. 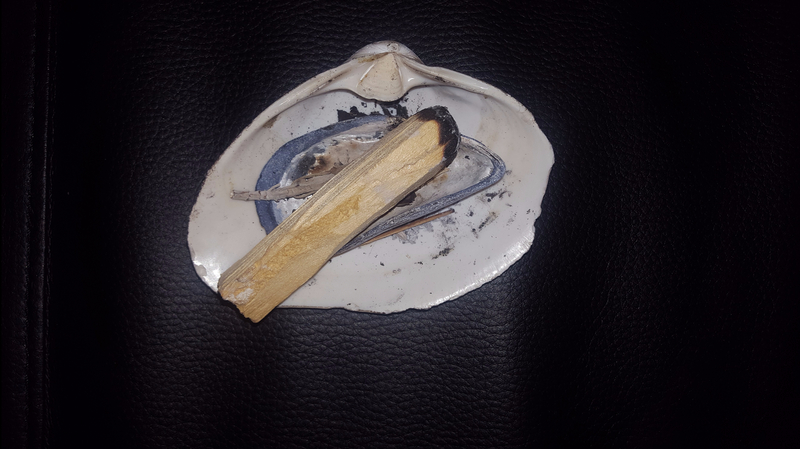 I thought the sage and Palo Santo were an appropriate picture to place at the beginning and end of this piece, as it’s used to clear a space of energy that no longer serves us and through each meditation I feel that’s exactly what’s being done. Please check out Dela’s blog at http://blackdollars.ca/ Thank you. Previous A Conversation between Man and Spirit.